HomeBlogHow can I prepare my child for their first visit to the dentist? How can I prepare my child for their first visit to the dentist? Dr. Namrata M., our Specialist Pediatric dentist at our BurJuman branch explains that parents must not only prepare the child, but rehearse what will happen during their dental visit. At what age should my child visit a dentist? The purpose of the age 1 dental visit is to learn about your child’s oral health and how to best care for your child’s unique needs before any problems occur. Who should accompany the child? If a parent has severe dental anxieties, he or she needs to make every effort not to pass those fears to their child. Studies show, most of the time dental fear is passed down from parents to children. If possible, ask another adult, someone who helps to care for your child, to come with you. What information do I need to provide the dentist? Provide the dentist with a list of any medical conditions, medications and their pediatrician’s phone number in case the dentist needs additional health information. Inform your dentist about the feeding/eating patterns of your child and thumb or pacifier habits. You may even carry their toothbrush and paste along. How can I prepare my child for the visit? Tell your child that you are going to a friend/uncle who is a doctor and he may check their teeth. You can bring a favorite toy, blanket or other familiar object. Use story time to kick-start a conversation e.g. Dora’s Visit to the Dentist or watch cartoons showing dental visits, these videos are available online. Play “dentist,” using props like tooth- brushes, flashlights, cups for rinsing and invite all their stuffed animals for a checkup. Don’t threaten your child by saying “if you don’t brush your teeth properly, the dentist will give you an injection” or “if you eat too much chocolate, your bad teeth will be removed by a dentist”. Don’t promise your child about the time it will take to treat them or the pain they may experience, as this can mislead them. Simply say you don’t know. What to expect at the dental visit? 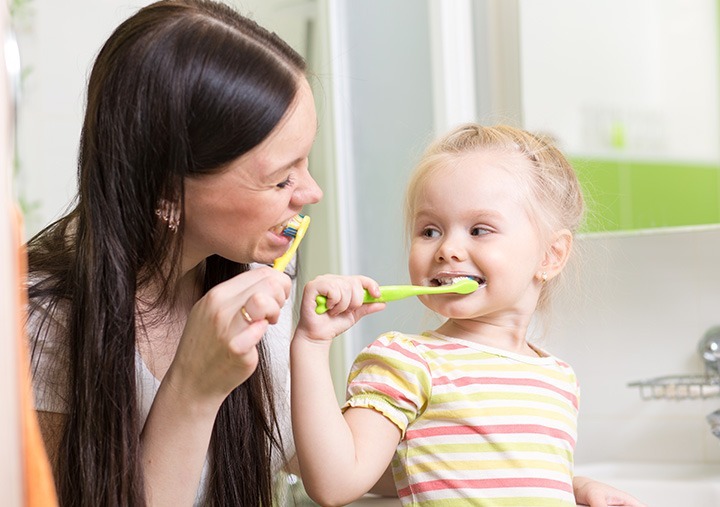 A review of your child’s history, discussion and advice on factors that affect the risk of cavities, such as diet, oral hygiene practices and fluoride use specific to your child. Demonstration of how to clean your child’s teeth. The dentist may also clean your child’s teeth and may apply fluoride, particularly if your child has a risk of developing cavities. If you would like to book an appointment with Dr. Namrata M. in our BurJuman branch please call (04) 284 5722.